Nobody attends carefully to the meaning of what I say, No other gift from any man can be compared to His (God's). Baba used to treat both Hindus and Muslims in an impartial manner. He would chant 'Allah Malik' which means 'Allah is the Almighty God'. He used to smoke from the clay pipe. He would lit lamps in the Masjid. He planted a basil in front of the Masjid. He allowed Hindus to worship and perform religious rites. A police inspector, Gopalrao Gund was a great devotee of Baba. Despite having three wives, he had no children. He became a father with the blessings of Sri Sai. Over-joyed, with the permission of Baba, he conducted Urs celebration at Shirdi. A Muslim, Amir Shakkar, performed the sandal paste ceremony in honour of the great Muslim Fakirs. The festivity of Ramnavami held at Shirdi is very auspicious and important for all Baba's devotees. Everyone would celebrate this ceremony with religious gaiety. 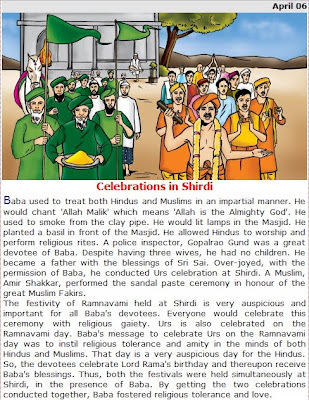 Urs is also celebrated on the Ramnavami day. Baba's message to celebrate Urs on the Ramnavami day was to instil religious tolerance and amity in the minds of both Hindus and Muslims. 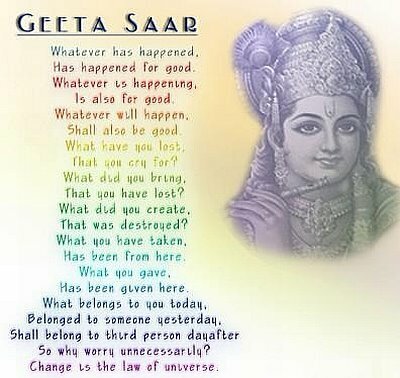 That day is a very auspicious day for the Hindus. So, the devotees celebrate Lord Rama's birthday and thereupon receive Baba's blessings. 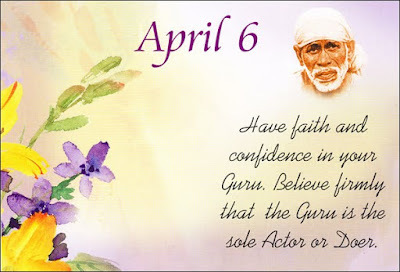 Thus, both the festivals were held simultaneously at Shirdi, in the presence of Baba. By getting the two celebrations conducted together, Baba fostered religious tolerance and love.